Willian has assured Chelsea fans he wants to stay at Stamford Bridge amid speculation of a possible reunion with former boss Jose Mourinho at Manchester United. The 29-year-old has not been a regular starter this season but marked his return to the side with a match-winning display in Tuesday night's 3-1 win at Huddersfield. 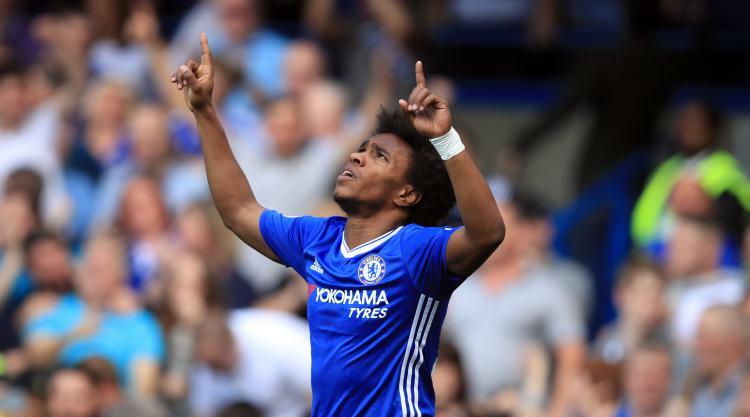 "I'm happy here and the fans can be calm," Willian said after Chelsea had turned in a much-improved display at the John Smith's Stadium. "I'm always happy here at Chelsea. I really like this club a lot with my heart. Yeah, I'm very happy." Willian has been repeatedly linked with a move to title rivals United after growing frustration over his lack of game time under Antonio Conte. The Brazil international has started only 12 games this season, but responded to his recall by heading home the second and laying on both Chelsea's other goals for Tiemoue Bakayoko and Pedro. "Of course I'm very happy," he said. "When I play, I always try to do my best to help the team to score goals to make assists and I did that with my team-mates." Chelsea bounced back from Saturday's defeat at West Ham by finally producing a display worthy of champions against Huddersfield. Conte repeated his assertion afterwards that the title race was over - runaway leaders Manchester City will move 14 points clear again if they win at Swansea on Wednesday night - but Willian is not giving up on Chelsea's title defence. "Like I said, we have to fight until the end. It's a big gap, but we have to fight until the end. We have a lot of games. "In football anything can happen. We have to fight. We will never give up, we have to continue. "We have to think about us and our performance and forget the others. We are Chelsea, a big club, and we always want to win." Huddersfield defender Florent Hadergjonaj was pleased his side had finished strongly after he stepped off the bench to fire in a brilliant cross for Laurent Depoitre to head home a stoppage-time consolation. "We didn't play like we did against Arsenal and Tottenham when we conceded four and five, here we tried to the end to play well for the fans," said the Switzerland international." The Terriers also lost at home to Manchester City at the end of last month thanks to Raheem Sterling's late winner. When asked who he thought was best side Huddersfield have played this season, Hadergjonaj said: "It's hard to say. Every team is different. "For me Manchester City was also a very hard game, but Chelsea had three strikers who were very quick, very good with the ball, technical players. "It's hard to say which one is the best team, but this one that just beat us is very good. "They (Chelsea) lost last week against West Ham and we knew that, but you saw here that Chelsea has very good quality and for us it was very difficult to play against them. "